Actress Ellen Page, right, and Samantha Thomas attend the premiere of "Freeheld" at the Toronto International Film Festival on Sunday, Sept. 13, 2015, in Toronto. Ellen Page had a special plus-one at the Toronto International Film Festival Sunday night. At the premiere of her latest film "Freeheld," the actress walked the red carpet with her girlfriend Samantha Thomas. This was the first red carpet for the couple. Why tonight, you may ask? Page told me with a big smile, "I'm in love." "Freeheld" has been a passion project for Page so the premiere seemed like the right time for their glamorous public debut. Page told E! News exclusively that "walking down the carpet holding my girlfriend's hand is pretty special." The two looked awesome as they both wore tuxedo ensembles. Page's look was from Saint Laurent and included tight black pants, black boots and a skinny tie. During the premiere event, close friend Ruby Rose couldn't help but gush about her close friend's latest project. "When your best friend is the most talented, funny, beautiful, generous, humble human being it's hard to not smile until it hurts," she wrote on Instagram. "Ellen, I am so proud of you and will always be grateful for everything you are and will always be to me." When you're not sure if you're a YSL Campaign or really stylish waiters. She later posed with Page and Thompson, but not before talking about their chic looks. "When you're not sure if you're a YSL Campaign or really stylish waiters," Rose joked on Instagram. For more from the 2015 Toronto International Film Festival, watch "E! News" Monday at 7 and 11 p.m. 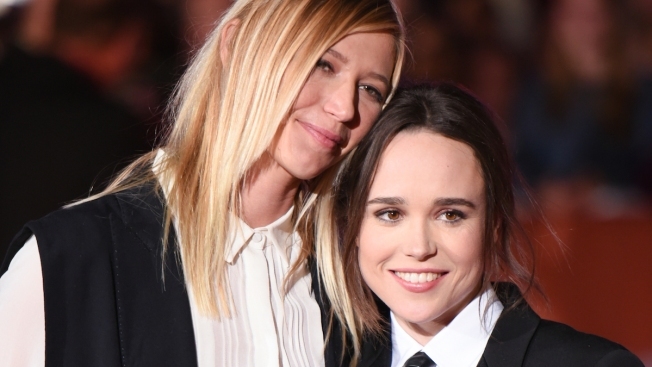 Original Post: Ellen Page Makes Red Carpet Debut With Girlfriend Samantha Thomas: "I'm in Love"